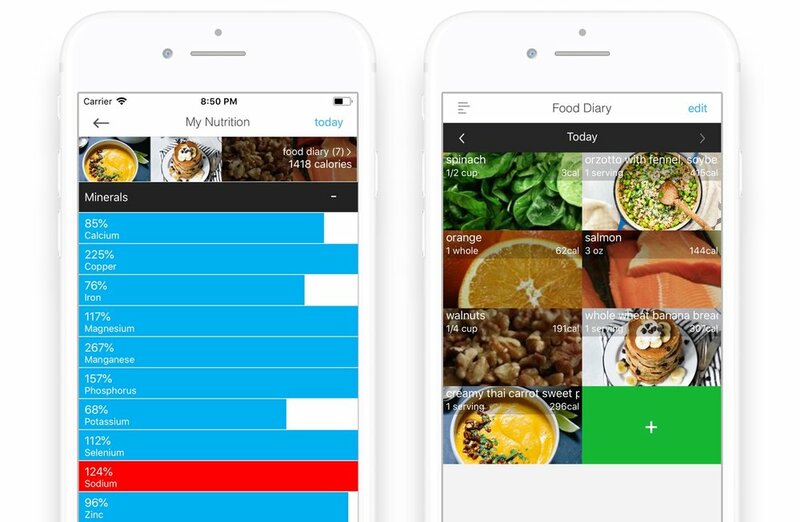 With the Wholesome app you can easily track the foods and recipes that you eat and monitor your intake of sugar and sodium. You may be surprised how easily you can reach your daily limits and Wholesome will warn you when you do. With a focus on improving health through nutrition, Wholesome was the winner of the Innov8 for Health award. If you'd like to adjust your sodium or sugar goals you can easily do that within profile settings. Simply enter the grams you'd like to track toward. Wholesome allows you to fully customize over 90 nutrient targets. 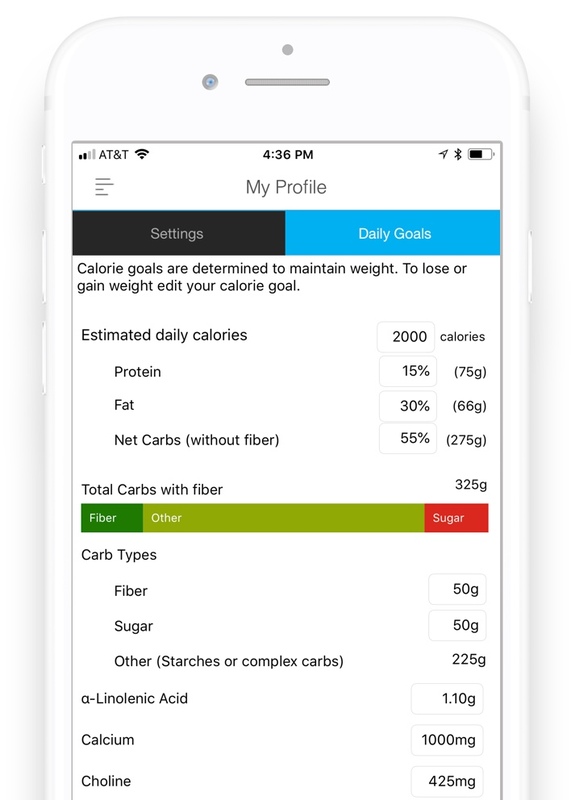 You can also choose how you'd like to view your nutrition tracker -- you can track toward 100% of your daily targets or simply view how much you've eaten in grams. Wholesome let's you create and save your own recipes and see how much salt or sugar is in them (along with 90 other nutrients). You can also browse community recipes or see your Facebook friend's recipes. With just one-click you can track an entire recipe. 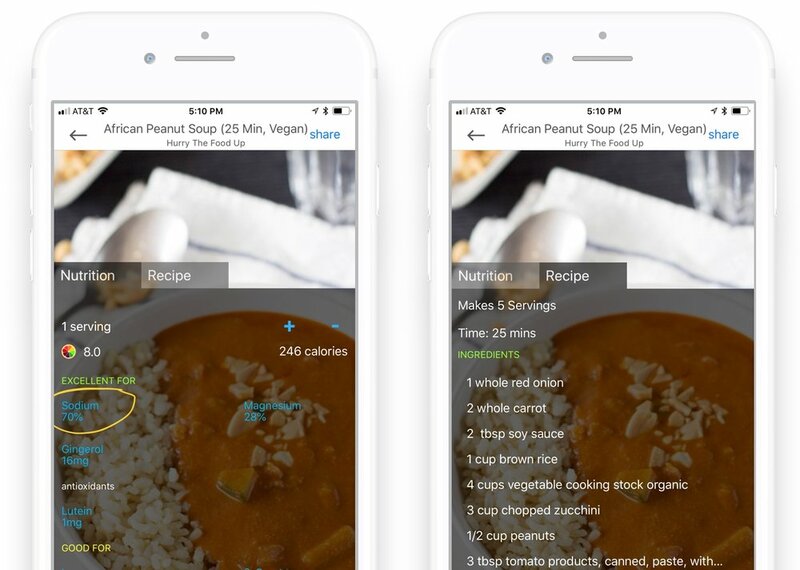 Wholesome calculates the nutrition of your recipe based on the ingredients and number of servings so you easily can see how much salt or sugar is in each serving. Vitamins: Vitamin A, Vitamin B12, Retinol, Vitamin B6, Folate (Vitamin B9), Vitamin C, Vitamin D, Vitamin E, Vitamin K, Choline, Pantothenic Acid, Thiamin, Riboflavin, Niacin. Minerals: Calcium, Iron, Iodine, Magnesium, Phosphorus, Potassium, Sodium, Zinc, Copper, Manganese, Selenium. Carotenoids (antioxidants): β-Carotene, α-Carotene, β-Cryptoxanthin, Lycopene, Lutein. Tocopherols (antioxidants): β-Tocopherol, γ-Tocopherol, δ-Tocopherol, α-Tocotrienol, β-Tocotrienol, δ-Tocotrienol, γ-Tocotrienol. Flavanoids (antioxidants): Cyanidin, Petunidin, Delphinidin, Malvidin, Pelargonidin, Peonidin, Catechin, EGC, Epicatechin, ECG, EGCG, Gallocatechin, Eriodictyol, Hesperitin, Naringenin, Apigenin, Luteolin, Isorhamnetin, Keampferol, Myricetin, Quercetin, Daidzein, Genistein, Glycitein, Isoflavones, Proanthocyanidins, Gingerol, Glucosinolates, Pterostilbene, Diallyl Disulfide, Molybdenum. Other: Cysteine, Betaine, Curcumin, L-DOPA, Resveratrol. Did you know that women are recommended to have twice as much iron as men and pregnant women need three times as much? Just set your profile and the app will take all of these factors into account and set your goals according to the USDA guidelines. You can also customize your own nutrient targets within settings. Wholesome is a fantastic tool for tracking your nutrition while pregnant or while trying to conceive. Folate (also commonly known by the synthetic form 'folic acid'), is a critical nutrient to consume while pregnant as it reduces the risk of neural tube defects in infants. With Wholesome, you can get it directly from whole foods and ensure you're getting enough. Just set your profile to pregnant, and your goals will adjust allowing you to track toward the USDA recommended intake levels of 600mcg. After having two different cancers in her childhood the founder of Wholesome developed the app with the help of her husband to get more healthfulness out of her diet. To date, Wholesome for iOS has had over 250,000 downloads and over 1.5 million whole foods tracked. The app has been featured on BuzzFeed, LikeHacker, CultofMac, and The Seattle Times.